Throughout Key Stage 3, students will have 2 lessons of Geography per week, and topics usually run per half term. Students are taught in their tutor groups throughout Years 7, 8 and 9. Bold indicates that a levelled assessment takes place at the end of this topic. Within year 7 students will study 6 units. The units are designed to develop students’ knowledge of location and place. Further their understanding of human and physical geography and develop their geographical skills and fieldwork. Students will be assessed in a range of ways throughout these units. Brazil – Students study both human and physical characteristics of Brazil. They investigate the rainforest ecosystem of the Amazon and the threats it faces and the causes, issues and management of the Favelas. Ice World – This topic looks at both the physical and human aspects of glaciation and how they influence different places and people around the world, most notably with a case study of Antarctica. Rivers – This unit includes the study of physical processes in river landscapes and human uses of rivers. Students complete a library research project on world rivers. Rocks and weathering – Within this topic students learn about the physical process of weathering and the landscapes produced. Students complete a fieldwork enquiry into limestone scenery in Cheddar Gorge. Weather: This topic enables students to find out about how the weather we experience is formed and how it affects different people. We also look at how we measure weather through making anemometers to assist with a project around school. Map Skills – Students work on developing their cartographical skills and their use of geographic information systems. Within year 8 students will study 6 units. The units are designed to develop students’ knowledge of location and place. Further their understanding of human and physical geography and develop their geographical skills and fieldwork. Students will be assessed in a range of ways throughout these units. Climate Change – Students learn about climate change from the Ice Age to present and explore the consequences it has and what humans can do to reduce their impact. Africa – Students will explore the contrasting continent of Africa. They will learn about the diverse environments, including the hot desert ecosystem and the challenges facing the human population. International Development – Within this unit students learn about uneven development and development indicators throughout the world. Development is explored through aid, trade, Fairtrade and globalisation. International Development– Students will learn about the differences between countries, and how trade and aid can influence countries differently. We will look at the Sustainable Development Goals, as a successor to the Millennium Development Goals, and how globalisation influences different peoples’ lives differently. How can our decision to buy or not to buy the cheapest items affect someone on the other side of the world? Russia – Students study both human and physical characteristics of Russia. They investigate Russia’s impact on the environment and the Chernobyl nuclear disaster. They will also explore the conflict in the Ukraine. China – Students explore the varied physical and human characteristics of China, such as; the growth of the Megacity, the emergence of China as a superpower and the challenges faced due to its population. Coasts – Within this topic, students learn about the physical processes that occur in the coastal landscape and the landforms produced. 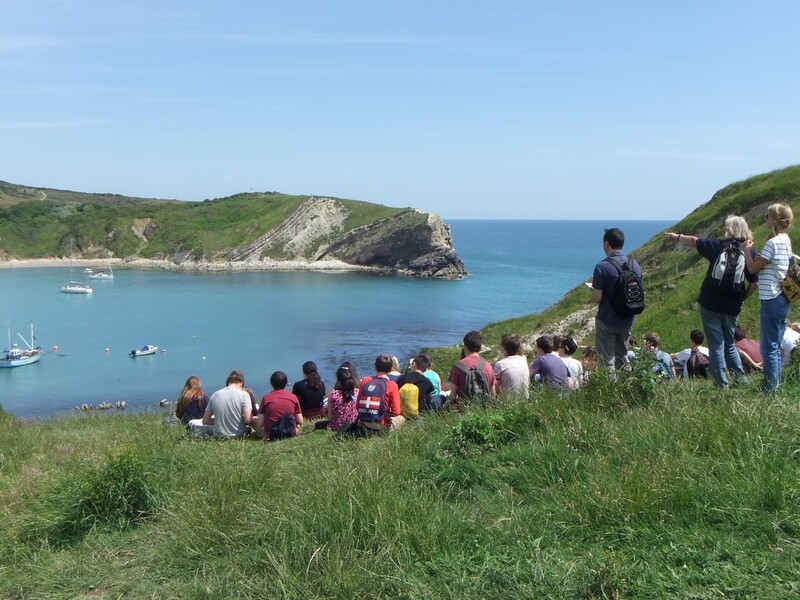 Students complete a fieldwork enquiry into coastal landforms at Lulworth Cove, based on the Trips Day outing in July. Within year 9 students will study 6 units. The units are designed to develop students’ knowledge of location and place. Further their understanding of human and physical geography and develop their geographical skills and fieldwork. Students will be assessed in a range of ways throughout these units. Tectonic Hazards – Students study the physical processes which lead to the formation of tectonic hazards. Through the use of examples they study the effects and management of such natural disasters. This is supported by visiting the Volcanoes and Earthquakes exhibition at the Natural History Museum on the STEM Trips Day in October. Middle East – Students explore the human and physical characteristics of the Middle East. They will study the conflicts in the region, natural resources and development. Extreme Weather – Students study the physical processes which lead to the formation of weather hazards. Through the use of examples they study the effects and management of such natural disasters. India – Students study both human and physical characteristics of India. They explore how India’s society and economy are influenced by values and attitudes. Energy– Students will explore the benefits and challenges of a range of renewable and non-renewable energy sources, using examples from around the world. They will take part in decision-making exercises, including a mini energy audit of the school, to decide the most suitable location for new solar panels and why these may be beneficial to St. Crispin’s. This topic aims to develop students’ evaluative skills, preparing them for GCSE Geography study. Mapping Festivals – Within this unit, students work on developing their cartographic and GIS skills. They will complete a decision making exercise, in which they use their cartographic skills to justify their choice of site for a music festival.